Packaging: Definetely slimmer than my other BB Cushion (TFS and Laneige). I love it because it save a lot of space in my make up pouch. Looks like a compact powder in the first glance. The color is mint green, best color for anything related to acne. I think the whole packaging is a little bit boring (Etude House usually have many cute ideas for their packagin) and the combination of mint color and compact packaging reminds me of Maybelline Clear Smooth compact powder *lol*. But, again this BB Cushion was targeted for troubled skin, maybe that's why they make it less fancy. Next, the cushion (bottom part) is sealed with sticker at the first time. Then I also notice something different with the cushion texture. While usually the cushion is quite soft and when I push it gently I can feel my finger sink into the cushion, this one is different. The cushion is a little bit hard and not too fluffy, and I need to push it with some effort if I want to dip my finger. But, in term of product, eventhough in my opinion the cushion is quite hard, it was soaked with a lot of product. I just need to tap a little to get the products on my puff. The air Cushion Puff is cream color! usually BB cushion comes with blue puff, but this one is different. Texture and Scent: Etude House BB Cream usually have pink color but this BB Cushion is a little bit yellow for me. It has a quite strong Ginger Scent! lol, I know it sounds weirds, but I swear I smell ginger when I use it at the first time. I even sniff the cushion in super close distance to make sure about it (maybe because this BB Cushion is for troubled skin, that's why it smells like medicine). Still not sure about the scent but if you looking for a scentless BB Cushion, this is not for you. Fortunately the scent isn't really long lasting, as I can't smell anything after few minutes. This BB cushion is also give a cooling efect after I apply it on my skin. Only few moments but I always love something cool on my skin. 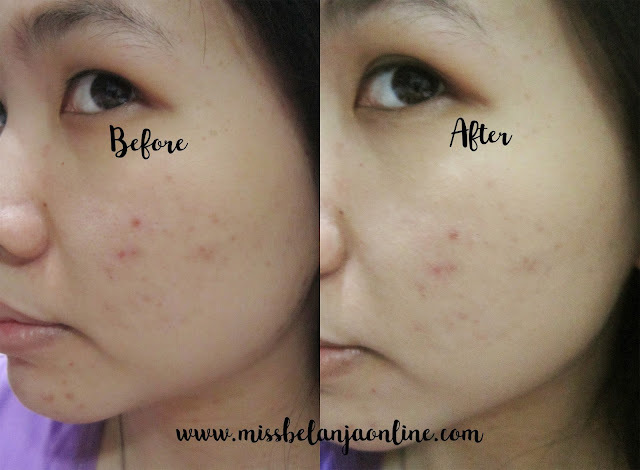 This BB Cushion also provide semi-matte finish result, which I really love because I have oily skin. I prefer matte finish rather than dewy. The texture is quite creamy and the coverage is sheer. Concealer is a must if I have more acne. The oil control and staying power are something that I love the most from this BB Cushion. It is long lasting and does help to make my face less oily even after 4-5 hours. One time, I used this BB cushion for a meeting, it was 5 hours meeting (I didn't use any oil control paper during that time) and when I was home, my make up is still set on its place and I can see my face slightly greasy especially on T-zone but not as oily as usual. On top of that, this BB cushion doesn't makes my skin breakout or makes my acnes became worse. Conclusion: I love this BB Cushion. It is good to use daily as it quite safe for my acne skin, it also has a nice coverage and long lasting. The price is aloso quite affordable for a BB Cushion. Have you tried this BB Cushion? PS: I also have another BB Cushion from Etude House, stay tune for my next review!